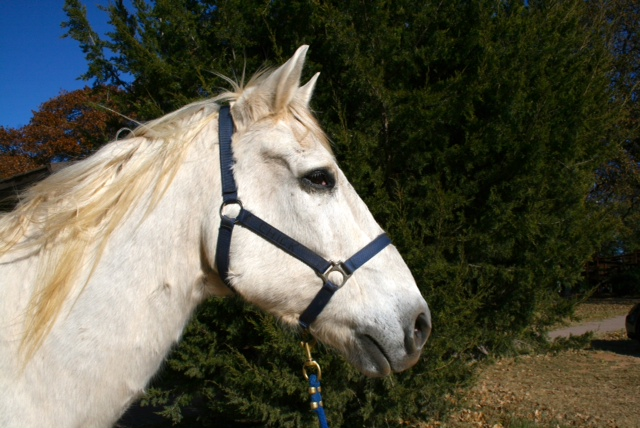 Easy is a gray Quarter horse who has become pure white in his old age. He is 30 years old and one of the oldest horses on the ranch. Most people may laugh at his name but as you get to know him you learn it fits him very well. Easy is one of the best therapy horses we have. His name fits him perfectly whether you are riding him, leading him, or just grooming him, he is an easy going horse. Easy has been part of the Rocky Top family for 7 years. Since the day he was donated we knew he was something special. He has carried every kind of therapy rider from very dependent riders to totally independent riders. He was immediately put into the therapy program and took to it perfectly. Today because of his age he only carries small children around. Although he is very old Easy is still doing his job and loving every minute of it. He gets special treatment in his old age like special treats for his old man teeth and a small private pasture with his best friend Cassidy.